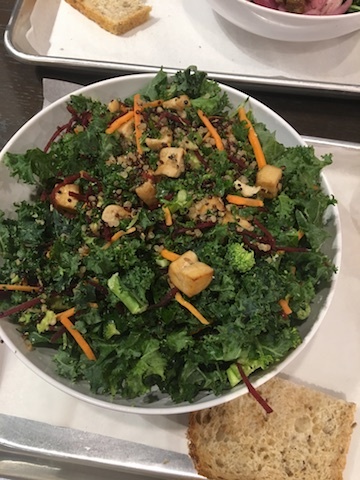 The biggest buzz in Champaign right now is CoreLife Eatery, a local restaurant that blends the fast food experience with healthy, fresh ingredients. Boasting with vegetarian, vegan, and simply low calorie options, everyone is sure find something they love. And the best part? CoreLife does not skimp on flavor or freshness. While ordering, you can see each ingredient being used. The avocados are even peeled right before your eyes, and all salad dressing are made in house. I was impressed with how farm-to-table the ingredients really were. I ordered a Sriracha Ginger Roasted Tofu Green Bowl with avocado, coming out to 400 calories. Did I mention that includes carrot chili vinaigrette? Not only was I stuffed, but I also got to take half of my meal home to eat for lunch the next day! The drink selection is also impressive, with variations on traditional lemonades and iced teas. Sample cups are available to try them all! To my surprise, the iced coffee was delicious, as well. I will definitely be back to CoreLife to eat my way through the menu. This restaurant is a true Champaign favorite, and it has nothing but success coming its way!